Datchet Lodge was one of the biggest & grandest houses in the village, dating from about 1770 and occupied by interesting families who ran exceptionally large households. It was built by James Haydock on an ancient plot designated as ‘ferry land’ which he leased from the Manor of Datchet. Haydock also owned Old Bridge House and the Post House on the opposite High Street corner and the site of Park Villas next up the High Street. The legal paperwork for all these properties has settled in a large and confusing bundle at Old Bridge House with little indication as to which deeds might refer to which purchase, inheritance or property. 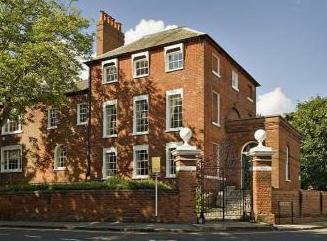 The house and its stables were converted into flats in the early twentieth century. James Haydock built Datchet Lodge on the ferry land which had become redundant once the first bridge was built in 1706, to be replaced by the second bridge in 1770. 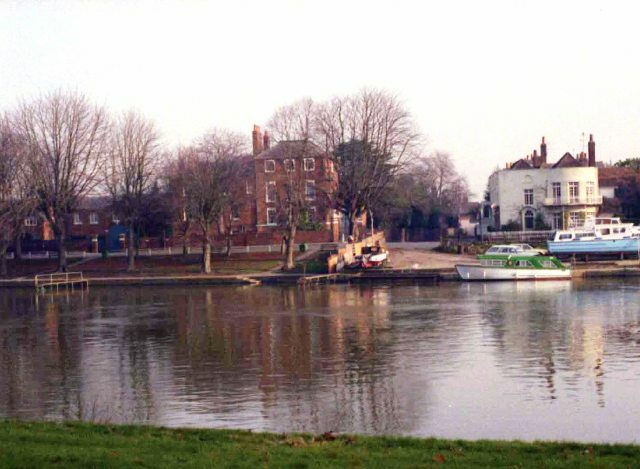 The provision of the ferry from the foot of Datchet High Street to the Windsor side of the river was a perquisite of the Manor of Datchet, so the ferry land belonged to the Lord of the Manor who leased it to whoever was running the ferry business. 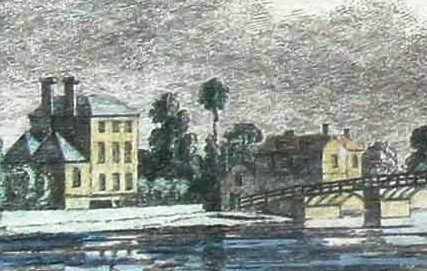 Although its purpose was redundant the ferry land was still leased out from some time after the first bridge was built in 1706 up to 1813 when it was finally sold to the Haydock heirs. Oram’s print of the first bridge (in situ 1706-1770 detail left above) was not published until 1780 and so must be a retrospective view. 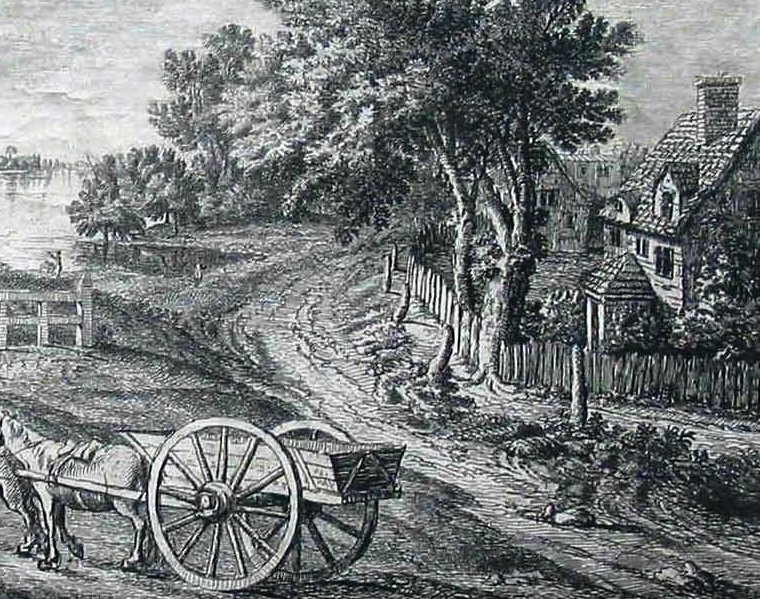 It shows a cottage built on the corner of the ferry land, but Datchet Lodge itself existed on that site by 1774 because that is the date of the print after Paul Sandby (above centre) of the second Datchet Bridge. (Compare with modern view top of page.) The lower blocks seen here adjacent to the main Datchet Lodge were much altered in the nineteenth and early twentieth centuries. 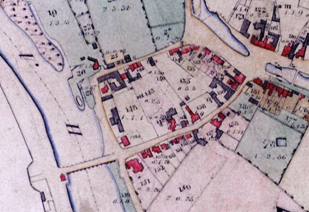 From 1781 to 1813 the Land Tax lists show that the Duchess of Buccleuch leased the ferry land to Haydock as occupier. From 1813 the owner changed to Haydock and the tenant to Dr Hebberden, who is known to have lived at Datchet Lodge. It seems therefore that Haydock built the new house while the land was only leased to him and that it may have been completed before he purchased any of his other nearby properties in 1773, 1775 and 1776. However, confusion caused by the bundle of deeds pertaining to all these different properties which had landed at Old Bridge House led to the legal title of Datchet Lodge from c1900 depending on deeds dated 1575 to 1622 – which actually belong to either Old Bridge House or the Post House. They continued to be cited, although the lawyers could not identify the property they referred to, because no documents seem to survive which record the Haydocks’ acquisition of the ferry land from the Manor. Datchet Lodge was owned and leased out by the Haydock Trust from James Haydock’s death in 1802 until it was bought in 1913 by Reginald Edwin Morris, barrister, who was already tenant there. The Trust operated a sequence of inheritance, involving compensation to other heirs if property was sold by one of them, so that the house deeds are yet further complicated. Reginald Morris died in 1931 and the house with its outbuildings was bought by Charles Masters, a property developer, in 1933. 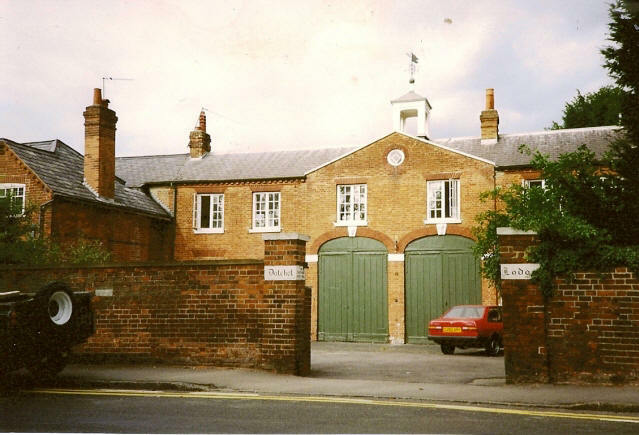 From this time the stables block was known as Queen Anne House and three more houses were built to the west within the original main plot, one known as Riddings, sold to Mary Taylor, and the others to D.G Gregory and C.E Betteridge. Philip K Blair-Oliphant came from a minor Scottish aristocracy family with their seat at Ardblair and Philip was described in the 1871 census as a Swedish Merchant and landowner. In that year his five children aged between three and ten (four daughters and a son) were all listed as born in Datchet. The household consisted of a German governess, a nursery maid and a schoolroom maid as well as a housekeeper, parlour, laundry and kitchen maids: fifteen people altogether occupying this large house. In 1881 the household was much the same but with several Lady’s maids replacing the child care. Philip died in July 1892 but by then was not living at Datchet Lodge. 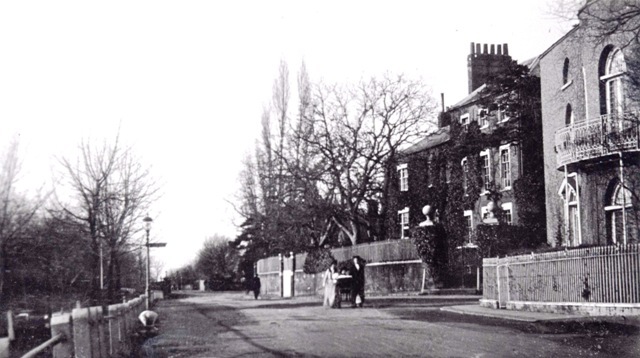 A year earlier, in 1861, a related Philip Kington, also a Swedish merchant, was recorded at a house in Horton Road and it was presumably his presence which brought the older (and richer) Philip K Blair-Oliphant to live in the village. In 1891 Philip’s son Lt Col Philip Lawrence Kington Blair Oliphant (2nd Batt. Rifle Brigade) was listed as the head of the household, with three of his sisters still unmarried living with him, plus the usual complement of maids. The household total was by then down to twelve but the gardener lived in what was probably part of the stable block. Philip Lawrence died of his wounds in France in 1918, aged fifty. In 1861 the tenant was Thomas Dixon Galpin, printer, publisher and newspaper proprietor of the firm Cassell, Petter & Galpin, which survived as Cassells, the well-known publisher of atlases. 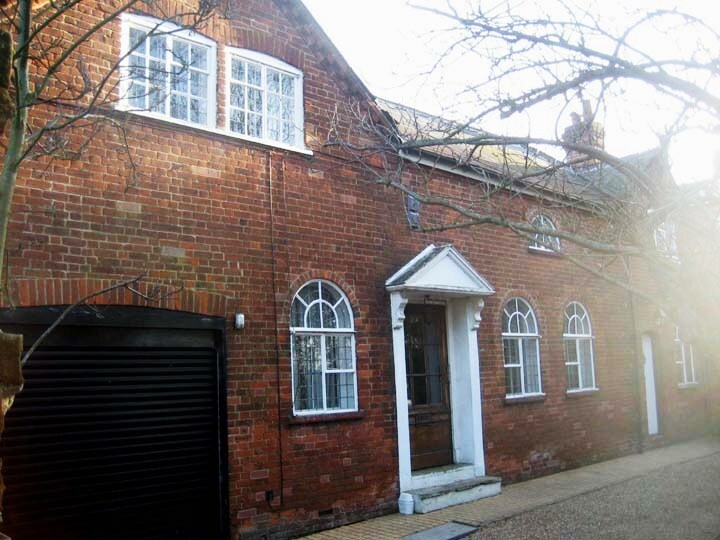 In the same year his partner George W Petter, described as a Private Publisher and Manufacturer employing 380 persons was also living in Datchet at Southlea Cottage. Thomas Galpin’s household exceeded the size of Blair Oliphant’s ten years later, with his six children between one month and eight years, four visitors and four servants. These children were all born in London and the family was not in Datchet for very long; in 1881 they were living in Putney with eleven children. James West and his wife Martha were in their fifties in 1851, living in Datchet Lodge with an unmarried daughter, a young son and three servants.Their eldest son James William had died in 1844 aged twenty one and was buried in Datchet churchyard. 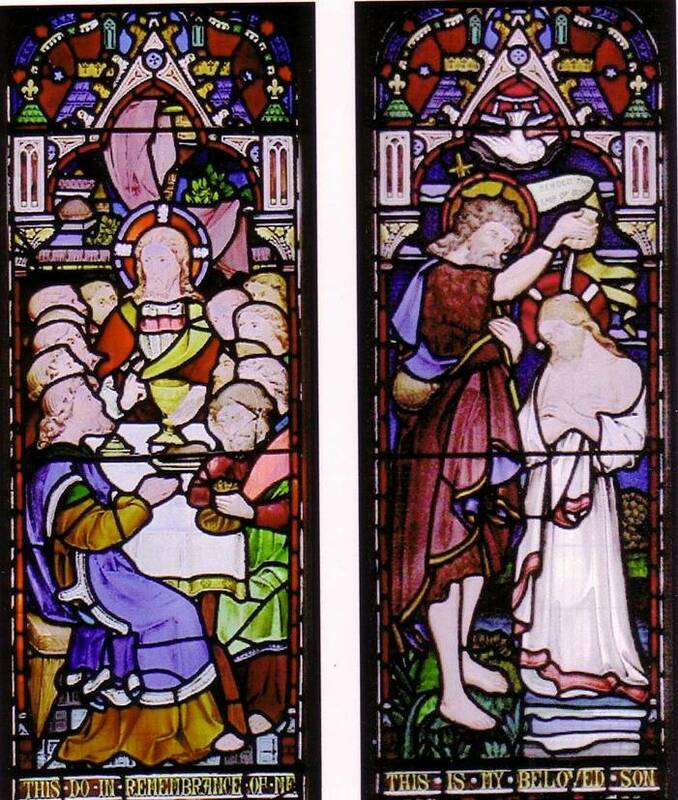 James’ wife Martha Ann died in 1860 and her family took a new opportunity for a memorial by dedicating a lovely painted glass window in the just rebuilt parish church. The village’s wealthy families were demonstrating their status by providing glass in the 1860s, all from just two glass-making firms. 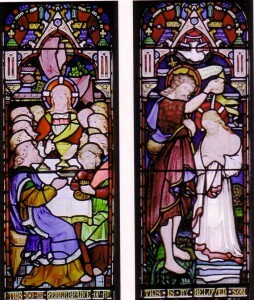 This window represents Christ at the Last Supper and the Baptism of Christ, which was particularly appropriate for the window’s position near the font, then in the south aisle. It was made by Lavers & Barraud in 1865 and is dedicated only to Martha Ann although James West died in 1864 aged eighty four. William Heberden, born in 1710, was a notable physician, made a fellow of the Royal College of Physicians in 1746 and colleague of Sir Edward Hulse who was physician to George III. The King held Doctor Heberden in high esteem and when Queen Charlotte arrived in England he named Heberden her physician in ordinary, a post William declined in case it interfered with his general practice. 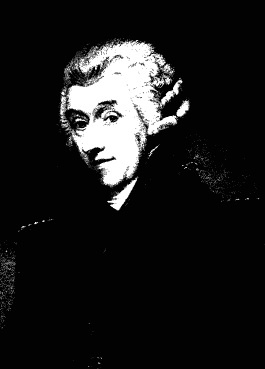 Heberden is considered one of the most eminent of English physicians of the eighteenth century, and was renowned for his charity and gentle manner. Samuel Johnson, lexicographer, literary biographer and one of Heberden’s patients, spoke of him as `Ultimus Romanorum, the last of our learned physicians’, although it has been asserted that he was more the `first of the moderns’. It has been said that he made `valuable contributions to the science of medicine’ with his lectures and publications. In 1783, after over thirty years continuous practice in London, he took partial retirement and resided during the summer months in Datchet, though continued for some years to return to London to practice during the winter. He began to compile in his seventies his Commentaries on the History and Cure of Diseases, which his son William Heberden the younger published in Latin and then in English after his death. Heberden died on 17 May 1801 at the age of 90, at his house in Pall Mall. He was buried in the parish church at Windsor, where his memorial is.The above information (from the Royal College of Physicians) complicates the history of Datchet Lodge because the occupier’s name is listed in the Land Tax as Haydock from 1781 with Heberden as occupier only from 1813 into the 1820s, after Barbara Haydock’s death. This Heberden must be William Heberden the younger, a reputed physician in his own right. It is possible that his father was previously tenant at the Old Bridge House as his summer residence rather than Datchet Lodge . There is no absolute proof that the Haydocks actually lived at Datchet Lodge rather than Old Bridge House, but the owners and occupiers as listed in the Land Tax do fit with the date of Barbara Haydock’s death and the two houses on the opposite corner owned by Haydock were occupied by a frequently changing series of tenants. The list of effects to be auctioned, before William Heberden the younger moved in, is extremely impressive, but her will suggests a rather different character: in it she asked for her funeral to be ‘conducted in a plain and decent manner without any parade’. The whole of the excellent and handsome household furniture, very rare and beautiful old oriental china, fashionable plated articles, glass, fine table and bed linen, paintings and books, a coach, handsome Sedan and bath chairs, a capital and powerful electric machine, a good 8-day clock, greenhouse plants, garden lights and implements, livestock, hay etc, together with a very choice cellar of uncommonly fine old Constatia, Madeira, Port and other wines. The furniture comprises neat 4-post and other bedsteads with suitable hangings, very prime goose-feather beds and excellent bedding, large mirrors, glasses, window curtains, Axminster and other carpets, good work in wardrobes, drawers and cabinets, tables, marble slab ditto, chairs etc. The china consists of several large jars exquisitely enamelled and other rare and beautiful pieces. The offices contain numerous useful effects, good kitchen requisites, brewing utensils etc. 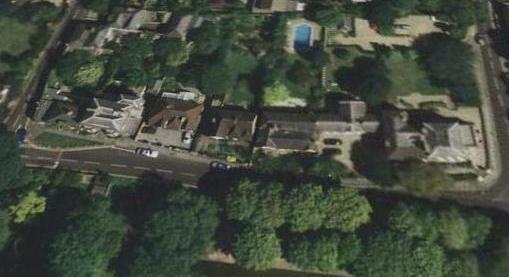 Datchet Lodge was bought in 1913 by Reginald Edwin Morris, barrister, who was already tenant there. He died in 1931 and the house with its outbuildings was bought by Charles Masters, a property developer, in 1933. 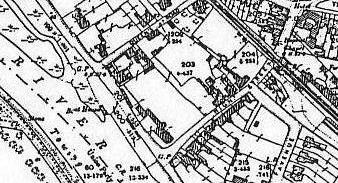 Dwellings had already been created within the extensive stable blocks which had originally been built at a little distance from the main house (see map at top of page) but Masters carried out further alterations. 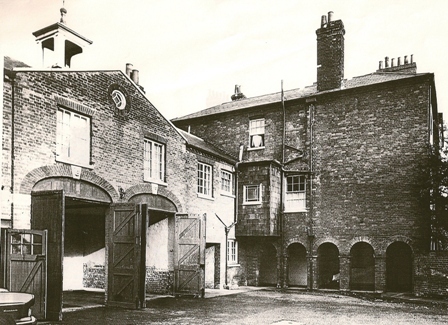 The result was two flats within the main house and four more in the stable block which is now known as the Courtyard. Queen Anne house was established as a separate single house and two completely new ones were built to its west, River Cottage and Riddings, thus infilling the whole frontage of the original ferry land plot. 18thC red brick, hipped slate roof with modillion brick cornice. Three storeys. Three double hung sashes with glazing bars in reveals, flat arches & blind hoods. 19thC closed porch on right hand; two storey, three window wing on left hand. Ground floor brick band at window cill level but stucco on main block. 18thC red brick, two storeys, slight central projection. Ground floor has two central elliptical archways with impost bands & keystones. First floor has 2:2:2 casement windows. Central pediment with circular window in tympanum. Welsh slate roof with 19thC wood turret.